دیوبند هفشجانی, لاله, برومندنسب, سعید, شیرازی, پویا, بی باک هفشجانی, سعید, مافی غلامی, رویا. (1394). بررسی اثر رقابتی یون‌های آهن، کادمیم و روی بر حذف سرب از محیط‌های آبی با استفاده از جاذب نانوساختار خاکستر سدر. مجله آب و فاضلاب, 26(3), 11-18. لاله دیوبند هفشجانی; سعید برومندنسب; پویا شیرازی; سعید بی باک هفشجانی; رویا مافی غلامی. "بررسی اثر رقابتی یون‌های آهن، کادمیم و روی بر حذف سرب از محیط‌های آبی با استفاده از جاذب نانوساختار خاکستر سدر". مجله آب و فاضلاب, 26, 3, 1394, 11-18. دیوبند هفشجانی, لاله, برومندنسب, سعید, شیرازی, پویا, بی باک هفشجانی, سعید, مافی غلامی, رویا. (1394). 'بررسی اثر رقابتی یون‌های آهن، کادمیم و روی بر حذف سرب از محیط‌های آبی با استفاده از جاذب نانوساختار خاکستر سدر', مجله آب و فاضلاب, 26(3), pp. 11-18. دیوبند هفشجانی, لاله, برومندنسب, سعید, شیرازی, پویا, بی باک هفشجانی, سعید, مافی غلامی, رویا. بررسی اثر رقابتی یون‌های آهن، کادمیم و روی بر حذف سرب از محیط‌های آبی با استفاده از جاذب نانوساختار خاکستر سدر. مجله آب و فاضلاب, 1394; 26(3): 11-18. هدف از این پژوهش تعیین کارایی خاکستر نانوساختار سدر در حذف سرب از محیط‌های آبی به‌صورت تک و چند‌عنصریبود. به‌این منظور خاکستر نانوساختار سدر سنتز شد و اثر عواملی چون pH، دز جاذب، زمان تماس بر کارایی حذف سرب در سیستم ناپیوسته بررسی شد. برای تعیین ویژگی‌های جاذب از آزمون‌های SEM، PSA و FTIR استفاده شد. تصویربرداری از نانوجاذب تولیدی با میکروسکوپ الکترونی نشان داد که قطر همه ذرات، کوچک‌تر از 207 نانومتر است. نتایج نشان داد که pH بهینه جذب سرب برای سیستم تک‌عنصری 6 و برایچندعنصری5 است. همچنین در سیستم تک و چندعنصری به‌ترتیببیشینه راندمان حذف 97 و 94 درصد و بیشینه ظرفیت جذب 27 و 21 میلی‌گرم بر گرم به‌دست آمد. مقایسه ایزوترم‌های فروندلیچ، لانگمیر و سیپس نشان می‌دهد که مدل لانگمیر،داده‌های سیستم تک‌عنصری را با ضریب تبیین 99/0 و شاخص خطای01/1، بهتر از سایر مدل‌ها توصیف کرده است. همچنین این مدل باضریب تبیین 99/0 و شاخص خطای024/0 برازش بهتری بر داده‌هایسیستم چندعنصریداشت. The objective of this study was to determine the efficiency of lead removal from aqueous (both single- and multi-element) solutions using the nanostructured ash cedar absorbent. Nanostructured ash cedar was synthesized and the effects of pH, absorbent dosage, and contact time on lead removal efficiency were investigated in a batch system. The absorbent was characterized by SEM, PSA, XRF, and FTIR. SEM results showed that all the particles had diameters smaller than 207 nm. It was also found that the optimum pH values for lead adsorption were 6 and 5 for the single-element and the multi-element systems, respectively. The maximum removal efficiencies of 94% and 98% and maximum adsorption capacities of 27 mg/g and 21 mg/g were obtained for the single- and multi-element systems, respectively. Comparison of the Freundlich, Langmuir, and Sips isotherms showed that the Langmuir model with R2 =0.99 and RMSE = 1.01 for the single element system described the adsorption data better than other models did. Also, this model with R2 = 0.99) and RMSE = 0.024 better fitted the adsorption data in the multi-element system. 1. Zhou, L., Wang, Y., Liu, Z., and Huang, Q. (2009). “Characteristics of equilibrium, kinetics studies for adsorption of Hg (II), Cu (II), and Ni (II) ions by thiourea-modified magnetic chitosan microspheres.”J. of Hazardous Materials, 161(2-3), 995-1002. 2. 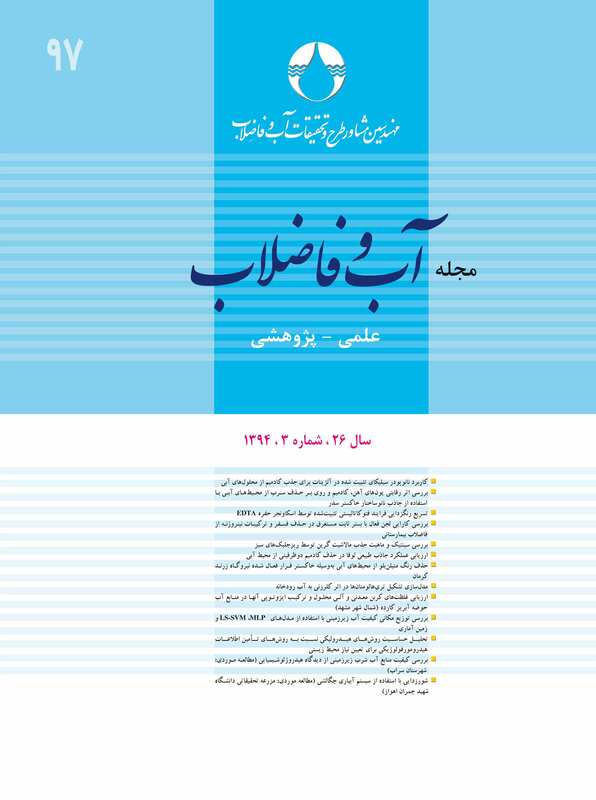 Amini, M., Younesi, H., Bahramifar, N., Lorestani, A.A.Z., Ghorbani, F., Daneshi, A., and Sharifzadeh, M. (2008). “Application of response surface methodology for optimization of lead biosorption in an aqueous solution by Aspergillus niger.” J. of Hazardous Materials, 154(1-3), 694-702. 3. Ray, L., Paul, S., Bera, D., and Chattopadhyay, P. (2005). “Bioaccumulation of Pb(II) from aqueous solutions by Bacillus Cereus M116.” J. of Hazardous Materials, (5), 1-21. 4. Rahmani, A., Zavvar Mousavi. H., and Fazli, M. (2010). “Effect of nanostructure alumina on adsorption of heavy metals.” J. of Desalination, 253(1-3), 94-100. 5. Kumar, U. ( 2006). “Agricultural products and by-products as a low cost adsorbent for heavy metal removal from water and wastewater.” J. of A Review. Scientific Research and Essay, 1(2), 33-37. 6. Han, R.P., Wang, Y., Zou, W.H., Wang, Y.F., and Shi, J. (2007). “Comparison of linear and nonlinear analysis in estimating the Thomas model parameters for methylene blue adsorption onto natural zeolite in fixed-bed column.” J. of Hazardous Materials, 145, 331-335. 7. Shyam, R., Puri, J.K., Kaur, H., Amutha, R., and Kapila, A. (2013). “Single and binary adsorption of heavy metals on ﬂy ash samples from aqueous solution.” J. of Molecular Liquids, 178, 31-36. 8. Depci, T., Kul, A.R., and Onal, U. (2012). “Competitive adsorption of lead and zinc from aqueous solution on activated carbon prepared from Van apple pulp: Study in single- and multi-solute systems.” Chem. Eng. Journal, 200/202, 224-236. 9. Futalan, C.M., Kan, C.C., Dalida, M.L., Hsien, K.J., Pascua, C., and Wan, M.V. (2011). “Comparative and competitive adsorption of copper, lead, and nickel using chitosan immobilized on bentonite.” J. of Carbohydrate Polymers, 83, 528-536. 10. Bestani, B., Benderdouche, N., Benstaali, B., Belhakem, M., and Addou, A. (2008). “Methylene blue and iodine adsorption onto an activated desert plan.” J. of Bioresource Technology, 99, 8441-8444. 11. Afkhami, A., Saber-Tehrani, M., and Bagheri, H. (2010). “Simultaneous removal of heavy-metal ions in wastewater samples usingnano-alumina modified with 2,4-dinitrophenylhydrazine.” J. of Hazardous Materials, 181, 836-834. 12. Escudero, C., Poch, J., and Villaescusa, I. (2013). “Modelling of breakthrough curves of single and binary mixtures of Cu(II), Cd(II), Ni(II) and Pb(II) sorption onto grape stalks waste.” Chem. Eng. Journal, 217, 129-138. 13. Li, L., Liu, F., Jing, X., Ling, P., and Li, A. (2011). “Displacement mechanism of binary competitive adsorption for aqueous divalent metal ions onto a novel IDA-chelating resin: Isotherm and kinetic modeling.” J. of Water Research, 45, 1177-1188. 14. Papageorgiou, S.K., Katsaros, F.K., Kouvelos, E.P., and Kanellopoulos, N.K. (2009). “Prediction of binary adsorption isotherms of Cu2+, Cd2+ and Pb2+ on calcium alginate beads from single adsorption data.” J. of Hazardous Materials, 162, 1347-1354. 15. Najaﬁ, M., Youseﬁ, Y., and Rafati, A.A. (2012). “Synthesis, characterization and adsorption studies of several heavy metal ions on amino-functionalized silica nano hollow sphere and silica gel.” J. of Separation and Puriﬁcation Technology, 85, 193-205. 16. Xin, X., Wei, Q., Yang, J., Yan, L., Feng, R., Chen, G., Du, B., and Li, H. (2012). “Highly efﬁcient removal of heavy metal ions by amine-functionalized mesoporous Fe3O4 nanoparticles.” J. of Hazardous Materials, 184, 132-140. 17. Pang, Y., Zeng, G., Tang, L., Zhang, Y., Liu, Y., Lei, X., Li, Z., Zhang, J., and Xie, G. (2011). “Highly PEI-grafted magnetic porous powder for highly effective adsorption of heavy metal ions.” J. of Desalination, 281, 278-284. 18. Dos Santos, A., and Masini, J. (2007). “Evaluating the removal of Cd (II), Pb (II) and Cu (II) from a wastewater sample of a coating industry by adsorption onto vermiculite.” J. of Applied Clay Science, 37(1/2), 167-174. 19. Gupta, V., Jain, C., Ali, I., Sharma, M., and Saini, V. (2003). “Removal of cadmium and nickel from wastewater using bagasse fly ash a sugar industry waste.” J. of Water Research, 37, 4038-4044. 20. Shih, H., and Dong, H. (2009). “Rapid removal of heavy metal cations and anions from aqueous solutions by anamino-functionalized magnetic nano-adsorbent.” J. of Hazardous Materials, 163, 174-179. 21. Liu, Z.R., Zhou, L.M., Wei, P., Zeng, K., Wen, C.X., and Lan, H.H. (2008). “Competitive adsorption of heavy metal ions on peat.” J. ofChina University of Mining and Technology, 18, 255-260. 22. Mohan, D., and Chander, S. (2006). “Single, binary, and multicomponent sorption of iron and manganese on lignite.” J. of Colloid and Interface Science, 299, 76-87. 23. Mahamadi, C., and Nharingo, T. (2010). “Competitive adsorption of Pb2+,Cd2+ and Zn2+ ions onto Eichhornia crassipes in binary and ternary systems.” J. of Bioresource Technology, 101, 859-864. 24. Srivastava, P., Singh, B., and Angove, M. (2005). “Competitive adsorption behavior of heavy metals on kaolinite.” J. of Colloid and Interface Science, 290, 28-38. 25. Wang, S., Terdkiatburana, T., and Tad, M.O. (2008). “Adsorption of Cu(II), Pb(II) and humic acid on natural zeolite tuff in single and binary systems.” J. of Separation and Puriﬁcation Technology, 62, 64-70.